I just had a call form the feed store where I buy pigeon feed. They have caught a young pigeon that was hatched in their warehouse and want me to take him. He is barely weaned and if I don't take him, he will likely be killed or released into a feral flock that is struggling from lack of food and freezing cold. We are expecting snow this week. Customers have been complaining about the feed they buy having pigeon droppings on the outside. The warehouse, where the feed is stored, is a 100 year old building with very high ceilings, at least 20 feet high. The windows are broken providing easy access to pigeons, sparrows, starlings and such. It would be expensive to repair the windows especially since they rent and even if they did, the warehouse doors are open all day as it is a very busy place. I have talked to them about building a little loft on the property as there is plenty of space for one but that isn't going to happen. I have suggested buying ovocontrol but that isn't going to happen either. What I can't seen to make them understand, is that the pigeon aren't going to go away. The one's they remove will be followed by others ready to take their place and so the cycle will continue. Honestly...what to do? I can't continue to take... just one more ...as I just don't have the space. Anything I haven't thought of? Oh Charis............You've thought about all the possible remidies for the warehouse, but as you said.........it's not going to happen. Is there no one in your area that would be willing to take in this bird???? I know what you're up against and it just tears your heart apart. You need some help there.!!! Only thing left for you to do is say no.........let the cards fall where they may for the little one.....I know you will not let that happen ........If I know you as well as I think I do........that's never going to happen. So....... somehow, someway find the space.....we all know you're going to do it. I wish I were closer to you........I would definately help you........actually we would propably help eachother.........it might not be so bad if you were not all alone to carry the burden of all these rescues. I'm in the same place as you are.........I'm dreading the baby bird season that will be here within the next 30/45 days. I have no room left either, but how?.......someone please tell me how??? can I turn away an innocent that would surely perish if I didn't step up and help. Would they be willing to board up the broken windows. I am sure that with local resources, we can find some discarded wood or how about tarps and sheets to cover the goods? Charis & Louise do either of you have a friend or know of someone that could foster some of the pigeons until homes could be found for them? Someone who would/could take the healthier pijjies not the ones that need meds or 1 on 1 care. Dog & cat rescues have foster homes & I think Micacoo has them. I talked to him about putting netting over the windows...apparently some of the windows are permanenly stuck open. He said they have tried tarps and that the tarps work but the guys forget to put the tarps back once they have removed what they want. I just sent him a link for birth control for pigeons and he is going to look into it. The bird is here...terrified to be without his little flock, which makes me feel very bad for him. he's only about 3 1/2 weeks old. Robin...I know I can impose on Yvette if need be and I appreciate that. We just don't have an organized network of pigeon people here. I know Louise doesn't in Vegas either. 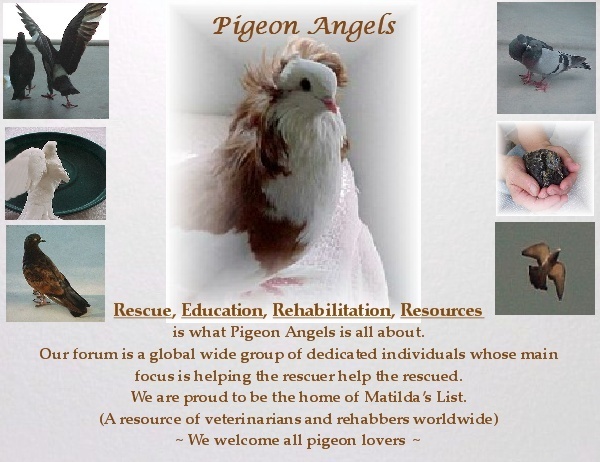 I do hope that with time we will have foster homes and more people that love pigeons and are willing to be involved. I hope that another solution can be worked out at the feed store. I wish the little guy here wasn't displaced. I knew what your answer would be , it was a shot in the dark asking. I too wish we live closer so Jeff & I could lend a helping hand. Living in a rural area like we do we don't get many calls about pigeons, which if you think about it can be a good thing. How's the little one doing, Charis? God bless you for taking him in, overwhelmed as you already were. I hope the man in the warehouse sees sense. Her mother and father were here eating, the other day and she was able to see them form her cage in the pigeon room. She went crazy, trying to get out to go with them. I felt sad that I couldn't let her go. I knew that if I did, it might mean her end. Oh, poor darling! Hope the weather improves real soon and that it won't be long before she can see her parents and flock. Do you worry in case she'll get too imprinted? I'll bet she is anxious to get out.